Times have been hard. To save on money, you've moved out of your old castle, and into a luxurious ravine. You didn't like that castle anyway; it was always getting looted, and never at a reasonable hour. And if it wasn't barbarians it was the plague, or sometimes both would come at once, and there wouldn't be enough chairs. The ravine is great; you get lots of sun, and you can just drop garbage wherever you want. In your free time you've taken up begging. Begging is brilliant conceptually, but tricky in practice, since no-one has any money. You beg twigs from the villagers, and they beg them back, but no-one really seems to come out ahead. That's just how life is sometimes. You're quietly conquering people, minding your own business, when suddenly there's a plague, or barbarians, or everyone's illiterate, and it's all you can do to cling to some wreckage as the storm passes through. Still, you are sure that, as always, you will triumph over this adversity, or at least do slightly better than everyone else. I’ve had Dominion: Dark Ages for exactly a month, now. Ironically, I now own a copy of each Dominion set except the base one. With the games I’ve experienced, I can say the expansion promises a prolonged game. Now, I don’t know if it’s just the early unfamiliarity with the new cards; but so far, in games heavily mixed with Dark Ages cards, my friends and I have never experienced a game less than or near to the average 30 min. playtime that usual Dominion game usually needs. It prolongs the game, however, in such a fun way. The expansion alone adds a lot of new game features that not only increases the likelihood of player interaction but also makes player interaction more intensely competitive. Attack cards (like Pillage, Cultist, and the unique Knight cards) seem to really “attack” and weaken the gameplay of your opponents. In fact, this particular expansion, depending on the mix of Kingdom cards in use, may make a player proud in buying a lot of attack cards – a characteristic I usually couldn’t see or experience with the previously-released expansions. A new Looter card system, which gives out useless action cards called Ruins cards, opens a whole new window of strategical opportunities to mess up opponents’ decks without the use of Curses and simple attacks. Another interesting addition this expansion brings are action cards that “upgrade”/”transform” themselves. Perhaps the most interesting addition to the game for me are new Kingdom cards that deal with trashing other cards and new Kingdom cards that carry over effects when trashed or when other cards are trashed; even cards that get to “dig” for trashed cards and gain them are introduced in this expansion. Because of Dark Ages, not only is there more value in trashing cards, but there is also a certain value in the trash pile. Other regular Dominion players I’ve played with claim they felt like newbies again while playing with a Kingdom of pure-Dark Ages cards. This may pose a need for adjustment in one’s regular Dominion strategem, but I think that’s what makes Dark Ages such a good expansion. Then again, maybe it’s just a personal preference since I’m one of those guys that enjoys trashing cards. For example, another new feature I found fun was the replacement of the 3 starting Estates with 3, relatively useless, Shelter cards. This alone forces everyone’s mindset into a heavy trashing game from the start – adds a rather new facet to the game. I’m pretty sure I’m not the first to analogize a card/board game expansion in the way I will do so now, but for Dark Ages, it’s really true: Dominion was an epic movie that had a lot of great “side-story webisodes”. Dominion: Dark Ages, for me however, is its big-screen comeback sequel. Now, we don’t all have to agree on the same reasons as to why Dominion: Dark Ages should get such praise; but economically speaking, Dark Ages is a sweet deal! Compared to the other large expansions, it gives 500 new cards (not just 300). As already expressed by many players, it also changes the face of the game with its new features without the use of fancy tokens, fancy cardboard mats, etc. Be it the numerous cards, the longer playtime, the radically new features, the intense player interaction, the rough Medieval motif, or the improved central theme of trashing, upgrading, and attacking, I don’t think anyone can argue against one who says that Dominion: Dark Ages is money well spent for a Dominion expansion. 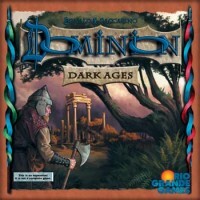 Add a Review for "Dominion: Dark Ages"